Okay, so I'm about to put this out there—until recently, I thought persimmons were a tropical fruit. I think it's because I didn't eat a single persimmon until a few years ago. Whenever I saw them, they were at the market, in the produce section next to the coconuts, star fruit, pineapple, papaya, mango...you get the point. Of course, that seems to be where the section they display the pomegranates in, too. A person can get the wrong idea. Don't get me wrong, I'm not blaming it on the supermarkets. My ignorance is my own fault (if fault is really a thing here). 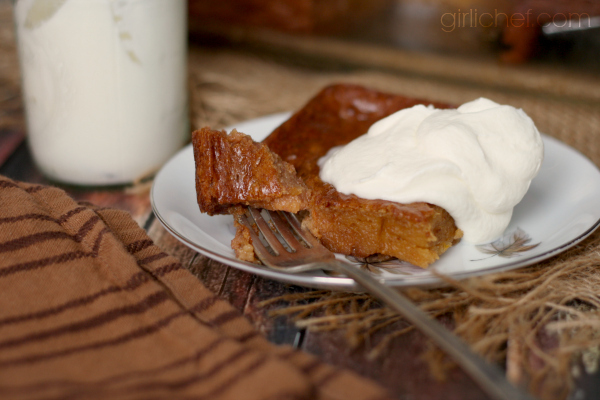 Recently I was paging through books and magazines to help me plan out my Thanksgiving menu when I stumbled across an article about and recipe for persimmon pudding. 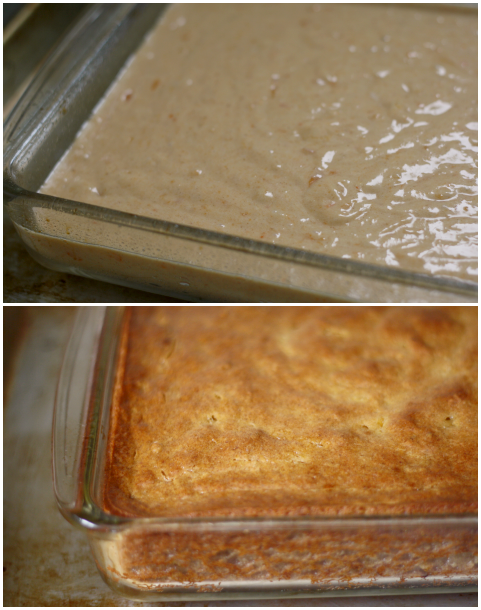 I was dumbfounded when I read the title "Indiana Persimmon Pudding". What? Indiana? I live in Indiana. Little did I know, persimmons grow wild across much of Southern Indiana and Illinois. Well, I live as north as you can get in Indiana without being in Michigan. So that explains it. Apparently persimmon pudding is a tradition and a staple in the Midwest (where I've spent almost my entire life) and the South. And yet, to me it was a brand new discovery. Trying to remember how many times I've actually eaten persimmons in my life, I can remember approximately three times before now. THREE. I just never really knew what to do with them (and apparently didn't bother doing even minimal research). But this little tidbit of knowledge reeled me in. The only two varieties of persimmons that I really knew anything about were the Japanese varieties Hachiya and Fuyu. Those are the kinds that I can find readily at the grocery store. 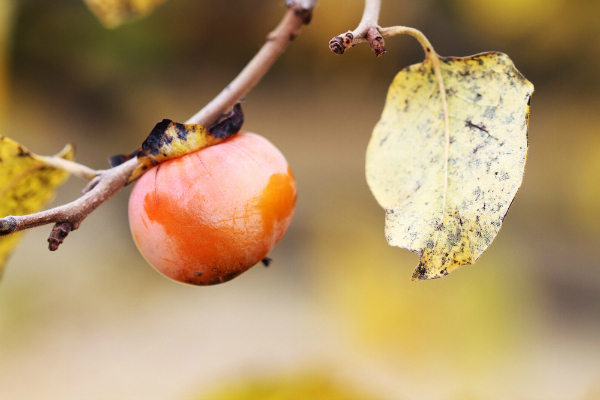 There are two different types of persimmons, astringent and non-astringent. Non-astringent (like a Fuyu) can be eaten while still fairly firm (but ripe) and be sweet. But if you try eating the flesh of an astringent one (like a Hachiya) before it is extremely soft and mushy (like, so soft that if you dropped it, it would splat all over the place), you get this furry dry-mouthed feeling that doesn't go away for quite some time. And yes, I'm saying this from experience. Tannins in the fruit are what determine their astringency (more tannin = more astringent). The ripening process breaks down these tannins, turning the juicy fruit extremely sweet and pleasant. So take my word for it, and wait. 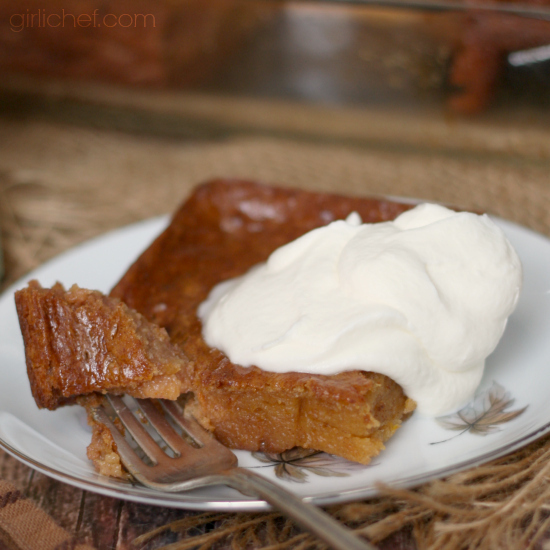 Now that the intrigue set it, I knew persimmon pudding was going to be on the menu this year. I couldn't find any local persimmons, known as the American persimmon (Diospyros virginiana), but since they are an astringent variety like the Hachiya, I used those instead. 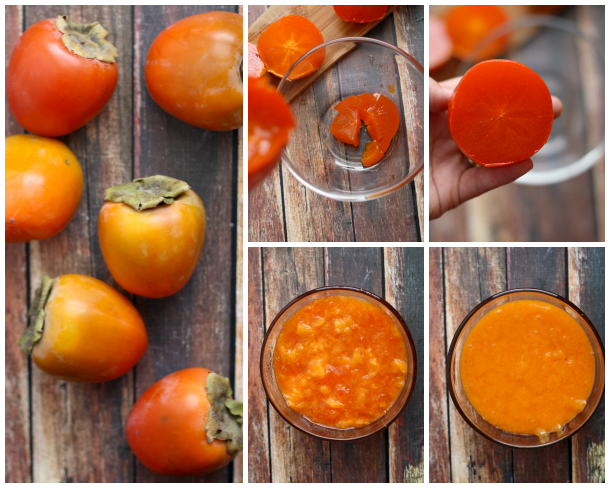 Scooping the gorgeous jewel-toned flesh from the skin is extremely easy if you use persimmons that are properly ripened. It's like buttah. The final dish was a bit of a revelation. Sweet and sort of custardy, it puffs up in the oven like a souffle, and once cooled a bit, the texture resembles that of pumpkin pie. I lowered the sugar in my recipe by half, as the original called for a full two cups. The fruit itself is so sweet that I could not imagine it would need that much. And it totally didn't. A cloud of barely sweetened whipped cream was all it needed to finish it off. Persimmon pudding is going to become a regular on our Thanksgiving menu, but I can't wait to see what other persimmon-infused delights are out there. You know, now that I'm more familiar with them, how to best enjoy them, and the fact that they don't really belong in the tropical fruit section in the market. 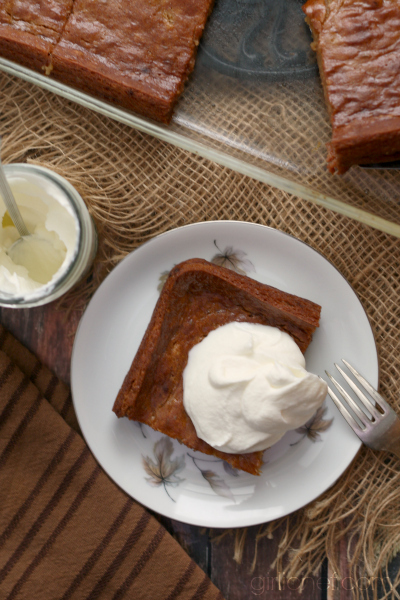 This lightly spiced baked pudding is a traditional Midwestern autumn and winter dessert. It is reminiscent of custard, and similar in texture to pumpkin pie. 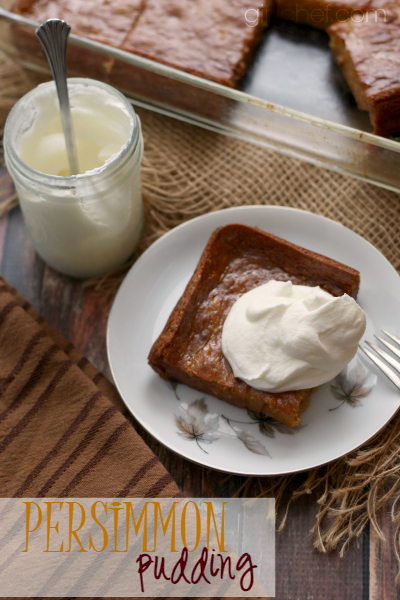 Delight your family by serving it after Thanksgiving dinner with a dollop of lightly sweetened whipped cream. Preheat oven to 350° F. Spray an 11" x 7" baking dish with nonstick spray, set it on a rimmed baking sheet (to prevent spills), and set aside. You will need persimmons so ripe and soft that if you dropped them on the ground, they would land with a splat. Cut them in half crosswise. Use a spoon to scoop the flesh from the skin; if you get one with seeds, pick those out. Once you've scooped the juicy flesh from all of your persimmons, stick your hands in and squeeze them. Since we want our puree smooth for this preparation, run it through a blender or food processor. If you measure, you should have a scant 2 cups of puree; if you have more, save it for another purpose (like these Spiced Persimmon-Bourbon Fizz cocktails). In a large bowl, stir together the persimmon puree, sugar, eggs, and vanilla until combined. Set a medium-mesh strainer over the bowl and add the flour, baking soda, baking powder, and salt; sift the dry mixture into the bowl. Using a rubber spatula or wooden spoon, stir dry mixture into the wet mixture until no dry spots remain. Stir the buttermilk, cream, and melted butter into the mixture until everything is well-combined. Pour into the prepared baking dish, then carefully slide the dish and the baking sheet it is sitting on into the preheated oven. Bake for 45 minutes until it has a deep golden color, is puffed up (similar to a souffle, but not as lofty), and pulling away from the edges of the pan. Let the baking dish cool on a wire rack until warm or room temperature. Slice and serve with a healthy spoonful of whipped cream or dusted with powdered sugar. Once completely cool, this can be wrapped and stored at a cool room temperature for up to 8 hours, or refrigerated for a day or two. Reheat until just warm in the microwave before serving. I find persimmons fascinating, I imagine because they still hold mysteries that I have yet to experience. If you feel the same way, check out this article on Drying Persimmons the Traditional Way (Hoshigaki) over at Shockingly Delicious. I'm dying to bite into a dried persimmon. Seriously. If you have any favorite recipes or ways to use/eat persimmons, feel free to leave them in the comments section below, or link to the recipe if it's online. Thanksgiving is almost here, have you finalized your menu yet? Find recipes, tips, tablescapes and more on my Thanksgiving Inspiration Pinterest board. Follow Heather Schmitt-Gonzalez's board Thanksgiving Food and Inspiration on Pinterest.